Russian nuclear attack subs to begin patrols on the east and west coasts of the United States. Last year in July we reported on the fact that Russia will increase patrols off both coast of the United States. 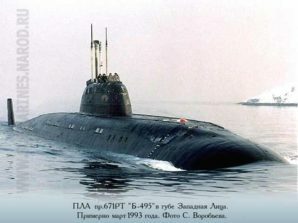 On June 1 or a bit later we will resume constant patrolling of the world’s oceans by strategic nuclear submarines,” Russian navy Commander Adm. Vladimir Vysotsky said Friday. This in apparent response to the “threat” posed by the United States which has adopted a “pre-emptive war strategy” and is considered by Russian military and intelligence officials as the single largest military threat to world peace and stability. Unconfirmed reports suggest that Russian nuclear submarines will patrol off the coast of the eastern United States to act as a deterrent to the growing American threat. “The Russian will also ‘bird dog’ US Naval aircraft carriers and battle groups when they patrol the world’s oceans. Make no mistake they do this to because of American wars over the past 10 years. Most American don’t seem to understand or comprehend that the US has been accused of serious war crimes, that include such things as “crimes against humanity, wars of aggressions, violations of international laws, genocide, terrorism, financing terrorism”, just to name a few (see article: “Will the ICC Act? Indictment against NATO” http://english.pravda.ru/opinion/columnists/16-11-2011/119646-indictment_second-0/ ). “These are very serious allegations, backed up by evidence”, says Roger Gravano of Charlotte, North Carolina, a well respected human rights activist and retired Naval officer. “Mainstream media here in the United States will never report such news”, he said. The number of annual routine patrols made by Russian submarines has dropped from more than 230 in 1984 to less than 10 today, RIA Novosti reported. That is all set to change because of recent actions taken by the United States, which may wage a pre-emptive war against Iran and Syria in the near future. The Russian navy has suspended its plan to dispose of its 12 nuclear-powered strategic submarines currently in service until 2020, in addition they will add 8 new Borey-class strategic submarines will be built. Borey class subs are considered some of the most advanced in the world. The Borei class (Russian: Борей; sometimes transliterated as “Borey”, also known as the Dolgorukiy class after the name of the lead vessel, the Yuriy Dolgorukiy) is a class of nuclear-powered ballistic missile submarine produced and operated by the Russian Navy. The class is intended to replace the older Delta III, Delta IV and Typhoon classes now in Russian Navy service. Advances include a compact and integrated hydrodynamically efficient hull for reduced broadband noise and the first ever use of pump-jet propulsion on a Russian nuclear submarine. Costing some 23 bln RUR ($890 million USD), Borei is approximately 170 metres (560 ft) long, 13 metres (43 ft) in diameter, and has a maximum submerged speed of at least 46 kilometres per hour (25 kn; 29 mph). In comparison the cost of an Ohio class SSBN was around 2 billion USD per boat (1997 prices). Smaller than the Typhoon class, the Borei was initially slated to carry 12 missiles but was able to carry 4 more due to the decrease in mass of the 45-ton Bulava SLBM (a modified version of the Topol-M ICBM) over the originally proposed R-39UTTH Bark. It should be noted that a fifth generation successor/supplement is already in development as of the publication of this report. All this is to help counter act what Russia sees as the growing threat posed by the United States which has been actively engaging in waging wars around the world, in places like Afghanistan and Iraq for over the last decade.